It is common in some churches I have personally attended where a pastor will say something like, I need twenty people to raise 1 million Naira each, and the twenty people come out. In some other cases, it is more like a countdown like from 1 million to 500 thousand to 100 thousand then stop at maybe 10 thousand. Some other churches also give recognition to members based on their monetary contribution to the church. Money as a material item can also be gotten outside the blessings of GOD. The devil is more than capable also to bless one financially. Thus one might steal and contribute to the church, and as such, we need to be able to distinguish what giving is all about. It is ideal that the heart of a Christian is strengthened and established by grace and not by foods and the monetary contribution which can also come from illegal sources. New Testament is giving focuses on the entire body of Christ and not just the pastors and priests compared to Old Testament giving which focuses mainly on priests. The emphasis in all our offerings as Christians is the Grace of our Lord Jesus Christ in the heart of the giver. The size, quality or quantity of the giving is irrelevant. What is relevant in giving is the grace of God at work in the giver. The grace of God in a man’s heart will cause a man to see giving as a privilege and it will not cause one to be ashamed to give anything no matter how small. Thus when a pastor starts a countdown for donation and stops at 10,000 Naira that means he is assuming anything less than 10,000 is not acceptable by GOD. 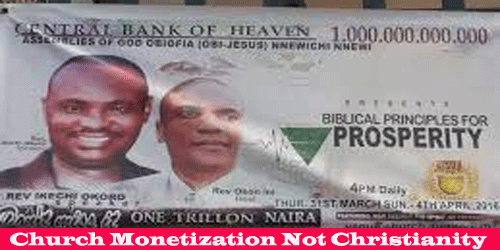 Whereas in the face of GOD, the person contributing 10 Naira having done so with true grace and dedication may be accepted more by GOD than the one who donated millions without grace but how many pastors recognize the 10 Naira when they stop most of their offering collections at thousands of Naira ?. The true purpose of GOD is not to build a church of just millionaires. His purpose is to build men and women full of Grace. Ephesians 2:8 says, “For by grace are you saved, through faith, and that not of yourselves.” The only way any of us can enter into a relationship with God is because of His grace toward us. All in All, the greatest offering one can give the Lord is to release his or her life selflessly in service to GOD and the body of Christ. This is easier said than done. To give yourself in service to GOD and to let go of the pleasures of this world takes true dedication and Grace. The devil is more than capable to make one a millionaire or billionaire, the different in the devil’s billionaire and the True Christian billionaire is Grace. The apostle Paul began many of his letters with the phrase, “Grace and peace to you from God our Father and the Lord Jesus Christ” (Romans 1:7; Ephesians 1:1; 1 Corinthians 1:3). God is the instigator of grace, and it is from Him that all other grace flows. The critical success factor in giving offering and Christian living is Grace and not show off. May the Lord help his Church and us. Amen. 1 responses on "Church Monetization Not Christianity"